Kay Chiropractic and Natural Health Care Center has moved to a new and much larger location at 600 Carlisle St., in Hanover, in order to better serve the community, Dr. Robert J. Kay said. Kay, who is originally from New Jersey, opened his first chiropractic practice in Maryland in 1987 soon after his graduation from Life Chiropractic College, where he said he spent several thousand hours of extra-curricular study in applied and clinical kinesiology, acupuncture, oriental medicine, Thompson, diversified of and sacral occipital techniques. His practice in Ellicott City, Md., drew many loyal patients who lived in central Pennsylvania and frequently begged him to open an office in this area, Kay said. Finding the perfect spot for his first practice in Hanover was fortuitous karma, Kay said, as one day he and his wife decided to take a spur of the moment drive to Pennsylvania to check out the area for a potential office. "We got lost and ended up in Hanover," Kay said, "There was a man getting ready to cross the street and we pulled over to ask him for directions. Then we asked if he knew of any buildings for sale or rent where I could open a chiropractor office." "Amazingly he was a Realtor and he said he had just gotten a listing today that would be perfect," Kay said with a laugh, "The rest is history." He signed the papers for the new office space that very day, Kay said, opening his first Hanover office at the corner of York and Middle Street in 1992. "We were the first alternative health care practice in Hanover," Kay said, "We don't treat disease — we treat people. We don't treat their symptoms. We treat the cause." As his Hanover area practice continued to grow, Kay said, so did the need for more space and over the next 20 years his office moved several more times, each time to larger quarters. The newest center has three times more space than the previous site, Kay said, and features a spacious, comfortable waiting room, large parking lot, expansive office space, plus five private treatment rooms. "We offer the most cutting edge diagnostic and treatment techniques available," Kay said. Keeping up with "cutting edge" techniques has been one of his highest priorities through the years, Kay said, as he obtained his naturopathic degree through the Clayton School of Natural Healing, is a certified nutritional consultant, and also studied Contact Reflex Analysis, NLP, Cranio-Sacral Therapy, Body Integration and is the founder of Body Energetics Technique. In addition to being a chiropractor and naturopath, Kay said, he is also a certified veterinary chiropractitioner, a certified nutritional consultant, and an internationally recognized researcher, practitioner and educator in the natural health field. He is the author of four books on Body Energetic Technique. In addition to his Hanover practice he also operates three other offices including his original practice in Ellicott City, Md., and chiropractic offices in Mount Pleasant, S.C. Like the situation in Hanover, Kay said, the latter two offices were also opened at the request of patients in those areas. "I often have doctors from John Hopkins and Mount Sinai refer their patients to me," Kay said, "I fly back and forth between my offices, and I travel all over the world to treat referrals." Some of his recent international patients were in Thailand and Costa Rica. His Hanover staff includes chiropractors Dr. Evan Kay, who is his son, and Dr. Kati Spletter, both certified in Body Energetics Technique; and massage therapist Jennifer Cook, offering medical massage therapy and reflexology. Associate Jed Castelbaum administers "microcurrent facelifts and the Asyra Body Scan, (which is) an electromagnetic therapy, to scan the body for cellular deficiencies, sensitivities, imbalances, stresses and other problems," Kay said. His practice also provides Veterinary Orthopedic Manipulation for the chiropractic care of dogs, cats, horses and cattle to treat hip dysplasia, lameness, incontinence, and other issues, Kay said. The smaller animals are treated right at the same office as human patients, and 'barn and stable call' appointments can be made for large animals. Dr. Robert Kay uses hand positions, also called mudras, as part of his Body Energetics Technique. 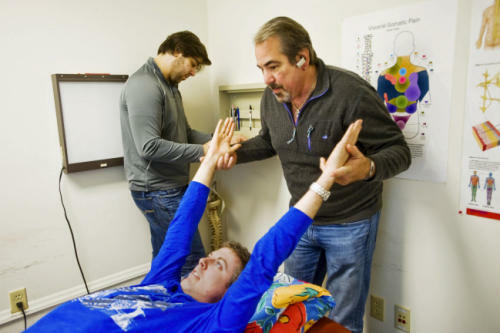 Kay says the method is almost "like a body sign language," allowing him to pick up frequencies in the body and indicating what areas are out of balance in the patient's overall health. Clare Becker - The Evening Sun. While most people think of chiropractic care as a way to relieve back and neck pain, Kay said, the comprehensive approach that he and his associates take can help with a multitude of diverse issues, such as allergies, autism, ADD/ADHD, athletic injuries, digestive troubles, fibromyalgia, diabetes, infertility, thyroid problems, emotional issues, MS, Lyme disease, tinnitus and much more. "We get our results naturally and we have a 96 percent success rate," Kay said, "People come to us as their last resort and they get results." The center offers many diagnostic and treatment options, Kay said, including chiropractic care, homeopathy, physical therapy, medical massage, Asyra Body Scans, IonCleanse Body detox, nutrition care and supplements and the Body Energetics Technique. His center is the only local practice offering Body Energetics Technique, which is a muscle testing technique, Kay said, "It's our way of speaking to the body to find out exactly what each person needs." Patients of Kay and his colleagues rave about their outstanding results, said Gladys Mathias of Hanover. Mathias said that she is a loyal repeat patient that has successfully lowered her blood pressure, taken care of joint and neck problems and gotten rid of allergies due to treatments at the center. "Anything that is wrong with me, this is where I come first," Mathias said, "The results are like a miracle." Sitting beside Mathias in the waiting room was another devoted follower, Rosalie Martin of Biglerville, who said that her treatments at the center helped cure her allergies. "I used to be flat on my back by Memorial Day because I could barely breathe," Martin said, "This is better than getting a prescription to just cover up the symptoms. Here you get fixed, you don't just get medicated up. I love it." Cynthia Michaud of New Cumberland said that prior to coming to the center she could barely stand or walk for more than six months and had been going to multiple doctors, including a neurosurgeon, who could not diagnose what was causing her problems. "My husband had to carry me to the car and carry me into Dr. Kay's office," Michaud said, "But I walked out of his office on my own that day after (chiropractic) adjustments and from that day on I started getting better."